Intractable management, concentration risk at Turner, and a troubling lack of franchise firepower could take a bite out of Time Warner stock. Today, the "new" fully independent Time Warner only commands $65 billion in market cap. And that's despite strong Q2 results. Revenue improved 3%, to $6.8 billion, while earnings rose 29%, to $0.98 a share, beating the consensus estimate by a whopping $0.14 a share. HBO provided much of that growth. Division revenue improved 17%, to $1.4 billion, including a 56% jump in content revenue thanks to an April deal with Amazon.com that brings some of HBO's older shows to the e-tailer's Prime streaming media service. Financial terms weren't disclosed at the time, but a $98 million year-over-year increase suggests it was lucrative. Newer programming also paid off in the second quarter. In the earnings release, Warner said that the fourth season of Game of Thrones averaged 19.0 million total viewers, surpassing the 2002 season of The Sopranos as the most-watched in HBO programming history. 1. Intractable management. Time Warner CEO Jeff Bewkes didn't just refuse Rupert Murdoch's offer. Apparently, he refused to even consider it. A Bloomberg report says that Warner sent Fox a "terse letter" rejecting the bid. Instead of talks, there was a "brief phone call." As a shareholder, I'd like to believe that Bewkes would at least entertain any serious offer. That he didn't here suggests we won't see a new deal anytime soon, if ever. 2. Concentration risk. Turner Broadcasting has done well, but represents more than half of Warner's operating income. New investments in original programming to distinguish TNT -- including the sci-fi adventure The Last Ship -- could pay off nicely if they hit. Yet, the quality and variety of online and cable programming could take a bite out of Turner's viewership, and Warner's profits. 3. Franchises are still in the development stage. With The Hobbit franchise ending soon, Warner Bros. doesn't have much in the way of a proven box office commodity. DC movies appear to be promising given the success of Man of Steel and the buzz for Batman vs. Superman: Dawn of Justice. There are no guarantees, however. We've seen both Batman and Superman fail at the cinema in prior years. No matter: Warner has committed dates for 10 new films aimed at beefing up the DC Cinematic Universe, kicking off billions in production and marketing costs with no promise of a significant return. Batman vs. Superman: Dawn of Justice kicks off a 10-movie plan to grow the DC Cinematic Universe. 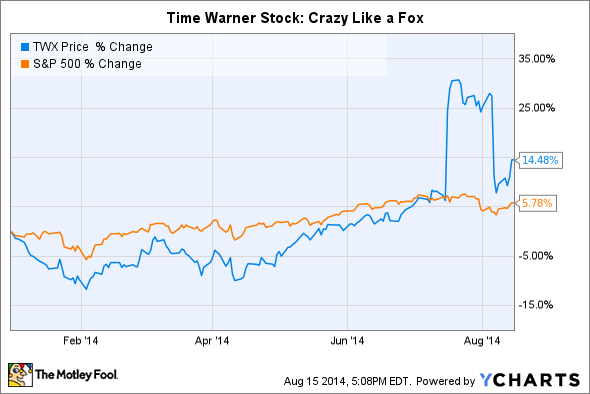 Credit: Warner Bros.
Time Warner stock has been a personal holding since 2011. If all goes well, I'll keep them through retirement, and well into old age. But as an investor, I also can't ignore the risks. Bewkes' apparent stubbornness in dealing with Fox, concentration risk in the form of Turner's outsized contribution to operating profit, and a troubling lack of movie franchises leaves Time Warner stock exposed, prone to falling further than it already has.